The U.S Environmental Protection Agency (EPA) Region 7 has recognized Truman as a collegiate member of its Food Recovery Challenge (FRC), a national initiative aimed at encouraging businesses, organizations and institutions to actively participate in food waste prevention, surplus food donation and food waste recycling activities. The FRC encourages organizations to find better alternatives to throwing food away. It helps organizations learn to practice leaner purchasing and divert surplus food away from landfills to hunger-relief organizations and onto the tables of those in need in the community. It also diverts suitable food scraps for composting or animal feed. Truman joins 18 other institutions already participating in the FRC in Region 7, which spans Iowa, Kansas, Missouri and Nebraska. N. Katherine Hayles, professor of literature and director of graduate studies at Duke University, will serve as the May 2014 Commencement speaker. In addition to her positions at Duke University, Hayles is a distinguished professor emerita at the University of California, Los Angeles. She teaches graduate seminars on contemporary American literature and cultural and literary theory. Hayles has been influential in shaping contemporary media theory through the concept of “media-specific analysis,” as well as through the robust and lively interactions she analyzes between print and digital literary works. Steeped in digital literature and culture, she believes the printed book has never been livelier or more interesting as a medium for experimental literature. The author of 10 books and more than 100 articles, her work “How We Became Posthuman: Virtual Bodies in Cybernetics, Literature and Informatics,” won the Rene Wellek Prize for the Best Book in Literary Theory for 1998-99, as well as the Eaton Award for Science Fiction Theory and Criticism. Additionally, her work has earned numerous accolades, including a Guggenheim Fellowship, two National Endowment for the Humanities Fellowships and a University of California Presidential Research Fellowship. Hayles earned bachelor’s and master’s degrees in chemistry from the Rochester Institute of Technology and the California Institute of Technology, respectively. In the field of English, she has a master’s degree from Michigan State University and a Ph.D. from the University of Rochester. Commencement ceremonies are scheduled for 2 p.m. May 10 at Stokes Stadium. For more detailed information on the Commencement ceremony, visit www.truman.edu/?p=14215. For those unable to attend, the event will also be live-streamed at new.livestream.com/trumanstateuniversity/commencement2014. Truman’s ROTC Program will commission eight graduating seniors as second lieutenants into the U.S. Army during a formal ceremony at 10 a.m. May 10 in the Student Union Building Alumni Room. The commissioned officers have earned their bachelor’s degree while simultaneously training in the arts of leadership and military tactics. The commissioning ceremony is a celebration of their achievements and marks the beginning of their careers in the military. For the last four years, they have been competing with more than 5,000 other cadets across the country for the honor to lead soldiers in the U.S. Army, Army Reserves and Army National Guard. “They are committed to excellence, dedicated to service, and I am extremely proud of each one of them,” Lt. Col. Steven Petersen said. The graduates who will receive their commission include: Jared Dietrich, infantry; Alex Fowler, ordnance corps; Katherine Linman, signal corps; Miranda Martin, medical services corps; Adrienn Myers, Army nurse corps; Mary Oliver, corps of engineers; Lindsey Owens, medical service corps; and Jacob Pipta, signal corps. ResLife hosted a dorm wars competition April 21-24 to raise donations for The Food Bank for Central and Northeast Missouri. The dorm wars raised 2,365 pounds of food for the Food Bank by asking residence halls to compete to see who could contribute the most donations. Ultimately, Blanton Nason Brewer Hall collected the most food and won. Additionally, the planning committee for dorm wars extended this event to the community by collecting food donations at HyVee and by hosting events at Bellacino’s and TruYo where part of the profits were given as a donation to the Food Bank. The dorm wars were part of a larger effort by ResLife to participate in the National Pay It Forward Week. This event was organized by the Service Living Learning Community, a hallway for co-ed freshman students who share a passion for volunteering. 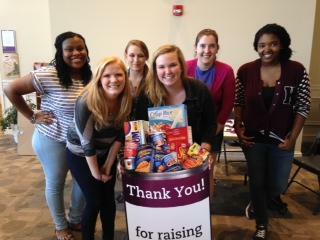 The Pay It Forward Committee poses together with donations after the dorm wars. Pictured, from left: Tashina Jemmott, Michaela Walsh, Lauren Cook, Alex Kuhn, Tori Holt, Dashia Lee-Carson. 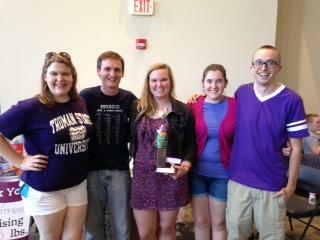 Student Advisors from Blaton Nason Brewer Hall accept their dorm wars trophy. Pictured, from left: Melissa Mossinghoff, Tommy Cassily, Alex Kuhn, Tori Holt and Zane DeZeeuw. Not pictured: Kaly Edwards, Kenzie Olson, Michelle Krahenbuhl, Zack Siress and Reba Atchley. The annual faculty and staff service recognition luncheon will take place at 12 p.m. May 13 in the Student Union Building Georgian Rooms. For those who are not an honoree but would like to attend this event in support of a colleague, tickets may be purchased for $10 in McClain Hall 101 no later than May 8. The list of honorees may be found online here. Four candidates for two permanent counselor positions at UCS will be on-campus to deliver outreach presentations followed by open forums. All members of the Truman community (faculty, staff and students) are invited to attend the presentations and open-forums. Vitaes and evaluation materials will be available at the sessions. You are invited to attend the opening of the time capsule found in the 1954 Science Hall Cornerstone. Sizes and selection are limited. For more information, contact Shelby Sims in the Center for Student Involvement at 660.785.4222 or ssims@truman.edu. All spring and summer graduates are invited to the graduate picnic from 11:30 a.m.-1:30 p.m. May 7 on the mall. There will be a free barbeque picnic with hamburgers, hot dogs, veggie burgers, sides, dessert and drinks. All graduates will receive an alumni T-shirt, plus, there is the option to register for door prizes, which include Truman watches, a Kindle and lots more. Those who cannot attend may stop by McClain Hall 205 after May 5 to pick up their alumni T-shirt. For additional details, contact Denise Smith at 660.785.4174 or bulldogforever2@truman.edu. This event is sponsored by the Truman Alumni Association, the NEMO Alumni Chapter and the Office of Advancement. The Center for International Education and Study Abroad has moved from its location in Kirk Building to its new home in Baldwin Hall 118. Truman’s central steam system will temporarily shut down from about 12 p.m. May 12 until about 9 a.m. May 15. Buildings without boilers will be without steam for building heat and hot water throughout the shutdown period. The following buildings have their own boilers and will not be affected by the shutdown: Barnett Hall, Campbell Apartments, Centennial Hall, Ryle Hall, Student Recreation Center and West Campus Suites. Joeseph Benevento, professor of English, recently had an article published in the New York Observer, commemorating the death of "One Hundred Years of Solitude" author, Gabriel Garcia Marquez. His article can be found online here. Truman Equestrian Team members Melissa Colby and Elizabeth Miller participated in the Intercollegiate Horse Show Association National Equestrian Championship, which took place May 1-4 in Harrisburg, Pa. Colby placed eighth out of 16 riders in the Individual Walk-Trot-Canter Equitation portion, while Miller took part in the USEF/Cacchione Cup Over Fences. Sarah Glenski, senior Spanish major and president of Truman’s chapter of Sigma Delta Pi, the National Collegiate Hispanic Honor Society, received the prestigious Gabriela Mistral Award for her academic achievements and noteworthy leadership and initiative in her chapter. The Gabriela Mistral Award is granted by Sigma Delta Pi’s national executive committee and may be presented to only one person per chapter. Seniors Dustin Staashelm and Nep Orshiso, and juniors Phil Kegode and Andrew Estes beat out 37 other teams at Northwest Missouri State’s third annual New Venture Pitch Competition to win the grand prize of $12,000 worth of various funding for their new business, Montavera. The website is an online platform similar to LinkedIn, designed to connect students to small to mid-sized businesses for internships, employment and freelance work. The Art Department will be hosting a public reception for the BFA visual communication thesis portfolio display 6-8 p.m. May 5 in the University Art Gallery. Refreshments will be served. CARE for AIDS will be collecting text books 10 a.m.-4p.m. May 5-9 at tables in Marguder Hall and the Student Union Building. All books help contribute to funding for rehabilitation centers for families in Kenya suffering from HIV/AIDS. The Stargazers will be having an open house 9:30-11:30 p.m. May 6 at the observatory at the University Farm. Come enjoy the wonders of the universe. The University of Canterbury Fall 2014 Study Abroad Program has extended their application deadline to May 1. Scholarships of up to $2000 are available to students who wish to study abroad in Christchurch, New Zealand. For more information, contact the Center for International Education at ciea@truman.edu or visit the Study Abroad Office in Kirk Building 114. Charter One's 40 TruFit Good Citizen Scholarships will be awarded to students who demonstrate the difference they have made in their communities through volunteering. There will be 10 scholarships, each worth $5,000, awarded to U.S. residents who will be attending a four year college, university or graduate program and who have been active in community service. Deadline is May 6 or until 2,000 applications have been received, whichever occurs first. For more information go to www.charterone.com/scholarship. The Missouri Greece Study Abroad 2015 program is offering five $1,000 scholarships for students who wish to study abroad in Greece for the spring 2015 semester. For more information, contact the Center for International Education at ciea@truman.edu or visit the Study Abroad Office in Kirk Building 114. Through a generous gift from Lloyd and Lois Elmore, a trust has been established to make scholarships of approximately $1,000 per semester (depending on need) available annually. Scholarship recipients must be active in a Southern Baptist Church or in a Christian Church, (Disciples of Christ). The scholarship recipients must attend Truman State University. Lloyd and Lois (Trower) Elmore operated a family farm in the Gibbs, Mo., community for 50 years before moving to La Plata, Mo., in 1968. Lloyd was a member of the Christian Church in Gibbs and La Plata. Lois was the daughter of a Baptist minister and attended the Southern Baptist Church in La Plata. She was also a member of the Loyal Bereans Class of the La Plata Christian Church. The Elmore’s established the trust fund to provide an educational opportunity for students in the northeast Missouri area who are actively involved in their church. Eligibility criteria: high school graduate from northeast Missouri; current Missouri resident; active involvement in a Southern Baptist Church or Christian Church, (Disciples of Christ); financial need; and acceptance to Truman State University. Selection criteria: completed application form; evidence of financial need; proof of acceptance to Truman State University; written letter of recommendation from the local clergy; and receipt of all the above by the application deadline, May 30. Renewal criteria: student must maintain a 2.50 grade point average; complete at least 24 credit hours in previous 12 months; evidence of continued active involvement in a Southern Baptist or Christian Church, (Disciples of Christ); and maximum renewal of three times. To apply, click here.